Global Warming, Thinning Ozone, Disappearing Resources and Overpopulation threaten Mother Earth and mankind. Using story, history, and personal anecdotes, McGaa demonstrates how America has strayed from the Natural Path. The rich ancestral wisdoms from the tribal peoples of Europe and from the Indigenous peoples of America are in danger of being lost, plunging us into chaos and despair as we tear ourselves away from the energy that created and sustains us. McGaa, an Oglala Sioux, uses the example of the Lakota Tribe as a beacon and exposes Organized Religion, false Democracies, Superstition and a dangerously deluded investment in a modern-man life model for the destructive forces that they really are. 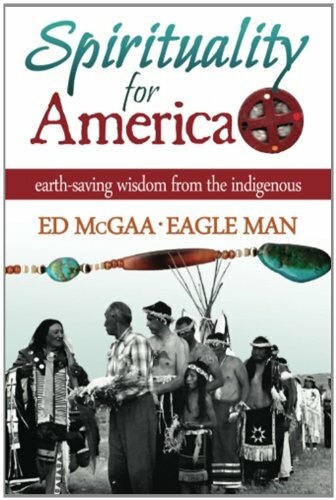 McGaa offers arguments, examples and possible solutions so that generations to come will be free to know the value and purpose of humanity’s place on Mother Earth. The Author is an enrolled Oglala Sioux tribal member, OST 15287. After serving in Korea he earned an undergraduate degree (St. Johns University MN). He rejoined the Marine Corps to become a fighter pilot. Major McGaa, returned from 110 combat missions to dance in six annual Sioux Sun Dances. He is a Bush Award recipient wherein he studied under two Sioux holy men, Chief Eagle Feather and Chief Fools Crow and Ben Black Elk, the interpreter for Black Elk Speaks. Eagle Man holds a law degree from the University of South Dakota.